The WinRM service failed to create the following SPNs: WSMAN/dcname.domain.tld; WSMAN/dcname. 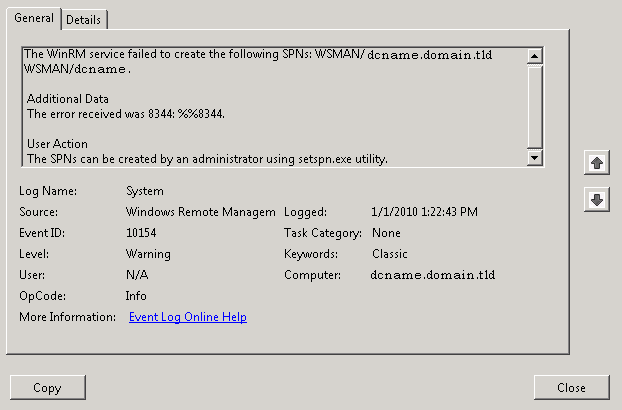 I was getting this error at startup in new 2008 R2 Domain Controllers. Apparently the WinRM attempts to create 2 SPNs (WSMAN/dcname.domain.tld and WSMAN/servername) after startup process. Since that WinRM runs under “Network Service” account, I was able to fix this warning by granting the “Validated Write to Service Principal Name” permission to the NETWORK SERVICE using the ADSIEDIT.msc. This will allow WinRM to auto create the necessary SPNs on that domain controller. After granting this permission, re-sync all DCs and do a reboot to each domain controller where you did the change, a couple of minutes after that reboot you’ll see that the warning is gone and the required SPNs were created successfully. Note: I didn’t had the WinRM IIS Extension installed, but I still saw the warning message. If you plan to use WinRM IIS Extension, you need to use “Add features” from Server Manager, reboot the system and run WinRM from cmd to configure it (e.g: WinRM qc). To learn more about SPNs, click here and here. To learn more about WinRM, click here andf here. To learn more about Network Service account click here and here. How did you grant the permission to NETWORK SERVICE in adsiedit.msc? What object did you select the security tab so you could set permissions for NETWORK SERVICE? Thanks. Worked for me! Thanks for publishing this tip. Thanks! It was very useful. Got this after I rebooted the primary 2003 DC on my forest. I have never seen this before and all google hits on this lead to fairly new reports, so I reckon it is caused by some update. I have followed this and it has got rid of the error message. Great. Following the instructions I get the feeling I have just created a system account of some sort with ADSIEdit. In Fact I can now see there are two NETWORK SERVICE accounts, one inherited from my domain and the new one I have created. Should I be concerned that I have created and account that Windows should or may try to in the future and fail causing some future instability. Follow the above still cannot. After add the Write Permission the warning go away. Is it OK to add NETWORK SERVICE Write Permission to the Domain Controller Object ?? ?